(Natural News) The nation’s largest provider and advocate of unborn baby murder is hilariously trying to virtue signal some kind of manufactured outrage over impending plans by President Donald Trump to end birthright citizenship for illegal aliens. Planned Parenthood ironically wrote in a recent tweet that it’s “despicable” and “egregious” for President Trump to deprive illegals of their ability to have “anchor” babies, which currently gain automatic citizenship simply for being born on U.S. soil. President Trump wants to put an immediate end to this loophole – and rightfully so, seeing as how birthright citizenship is widely abused. Many non-citizens will travel to the U.S. simply to have their babies within our borders, which grants these illicit children all the same rights and privileges afforded to actual American citizens. “Eliminating #birthrightcitizenship would be incredibly harmful & is part of this administration’s radical, hateful agenda to stoke fear in our communities and contribute to many people’s already very real fear of deportation,” Planned Parenthood put on its Twitter account. Since when does Planned Parenthood care about unborn children being deprived of birth? The utter hypocrisy and blatant irony of such statements from an organization that exists primarily to murder unborn children did not go unnoticed. Many Twitter users were quick to point out the stupidity of Planned Parenthood, which apparently only cares about the lives of illegal aliens in the womb – and definitely not black lives in the womb, which are murdered at a rate higher than any other group. 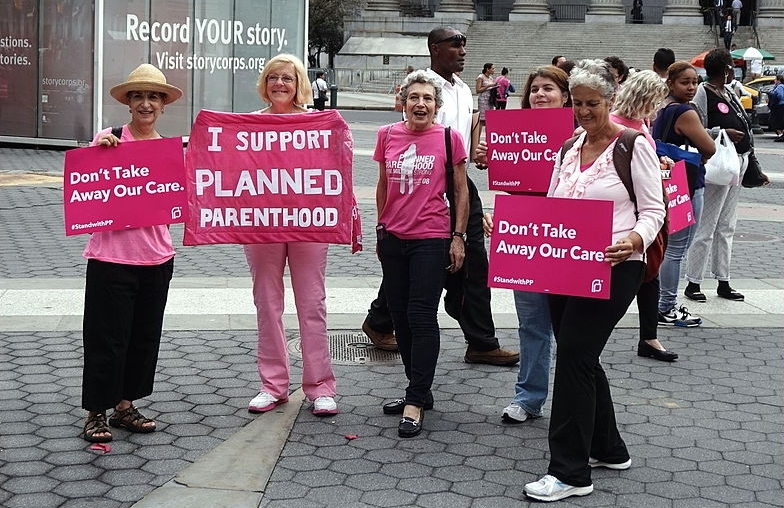 “Planned Parenthood arguing FOR ‘Birthrights’? Let me check the irony meter,” wrote one Twitter user, along with a link to a GIF depicting an atomic bomb going off. “What would you know about birthrights?” tweeted another Twitter user directly to Planned Parenthood. These are all valid points, as was the one made by NRA spokeswoman Dana Loesch when she asked if this means that Planned Parenthood opposes birthright citizenship. Naturally, the abortion provider failed to respond to any of these tweets. To those who would maintain that birthright citizenship isn’t that big of a deal, consider the findings of a recent Congressional Budget Office report, which found that the total anchor baby population now exceeds the number of annual citizen births in the U.S. from actual American citizens. It’s a very serious problem, in other words, and one that President Trump has promised to deal with – using an executive order, if necessary. “It was always told to me that you needed a Constitutional amendment – guess what? You don’t,” the president stated during a recent interview with Axios. “Number one, you don’t need that. Number two, you can definitely do it with an act of Congress. But now they’re saying I can do it with just an executive order. Now, how ridiculous – we are the only country in the world where a person comes in, has a baby, and the baby is essentially a citizen of the United States for 85 years with all of those benefits? It’s ridiculous. It’s ridiculous – and it has to end,” the president added. If President Trump follows through on this promise, which he is expected to do, there will be “immediate and far-reaching consequences,” according to Breitbart News. Among these consequences – or victories, depending on how you look at it – would be an immediate drop in the number of foreigners coming to the country simply to have babies. For more news about what President Trump is up to, be sure to check out Trump.news.